Deep in the heart of the Louisiana swamp, there lives a poor fur trapper, his second wife, and his twins. The stepmother has a plan to leave the children in the swamp to alleviate the family’s financial problems. 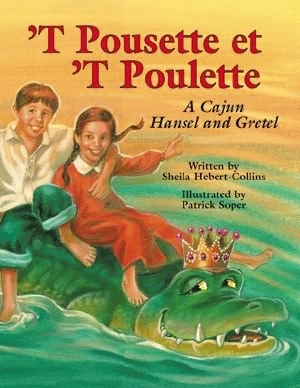 See how the Cajun Hansel and Gretel outsmart her plan and escape from the witch who lures them into her cottage. This Cajun twist to a classic fairy tale is sure to grab the attention of children because many young people actually made a contribution to the story. A class of 8th grade students assisted the author in its development, and is credited in the book for doing so. What better way could a young person’s imagination be set in motion than to realize that one small voice could be heard in such a big world? Sheila Hébert-Collins, a school teacher, has a passion for children’s literature and enormous pride in her Cajun heritage. She credits her students with helping her to become a better storyteller. She is listed on the Louisiana State Artist Roster as an author and Cajun storyteller, and often makes appearances in schools throughout the state. 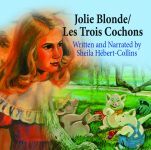 She also has written Cendrillon: A Cajun Cinderella, Jolie Blonde and the Three Héberts, Les Trois Cochons and Petite Rouge: A Cajun Twist to an Old Tale, all published by Pelican. Award-winning illustrator Patrick Soper has joined Collins for their fourth collaboration in ’T Pousette et ’T Poulette. He has illustrated Cendrillon: A Cajun Cinderella, Cajun Folktales, Contes Populaires Cadiens, Mardi Gras in the Country, and A Christmas Dictionary, all published by Pelican.